You can’t have an Easter Egg hunt if you don’t have an Easter basket! 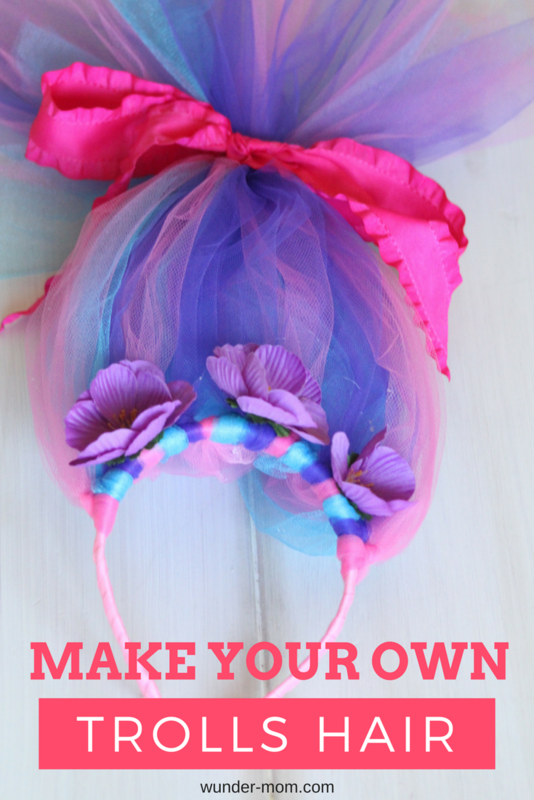 Try this easy Easter craft tutorial to make your own DIY Tutu Easter basket from recycled materials. This week my daughter will be having an Easter Egg hunt with her kindergarten class at school. 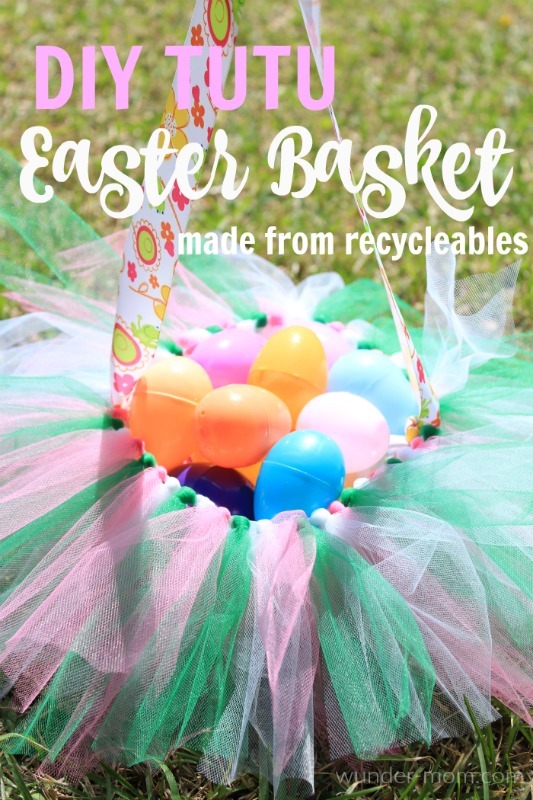 Part of the assignment for the fun Easter activity was to create an Easter Basket with recycled materials. 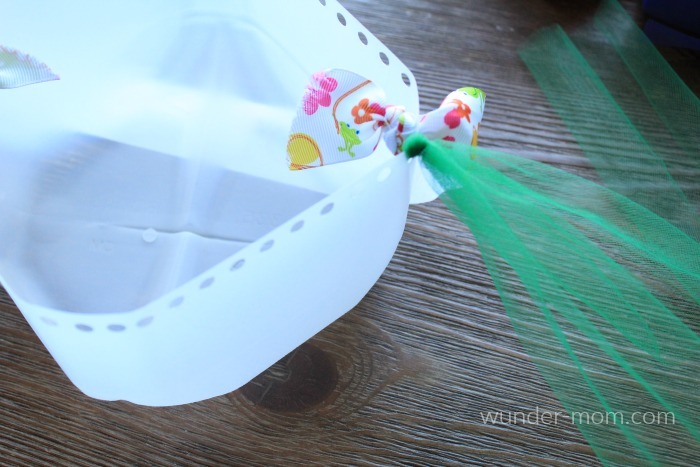 Suggestions were to use boxes, milk jugs, or other recycleables and dress them up to make an Easter Basket. 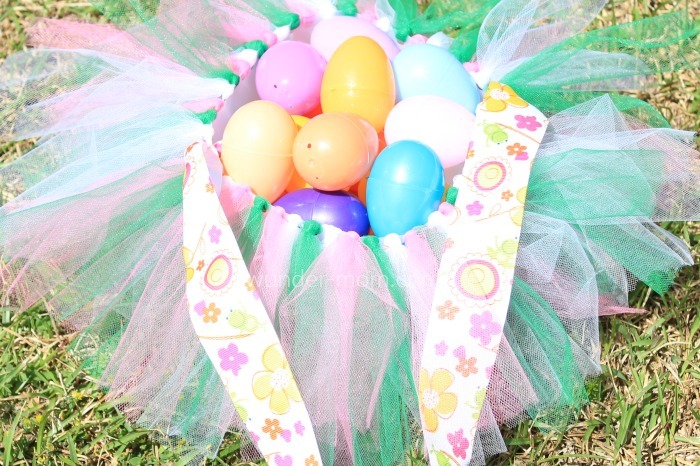 We happen to love tulle and tutus around here and came up with this adorable and easy DIY tutu Easter Basket made from a milk jug! With no sewing, or even gluing involved, it was a perfect DIY Easter Basket to make with my Kindergarten aged child. Start by washing and drying your empty gallon sized milk jug. You will then want to cut off the top half with a pair of utility scissors, keeping as much as the bottom half as you can. I made my cut just under the bottom of the handle. 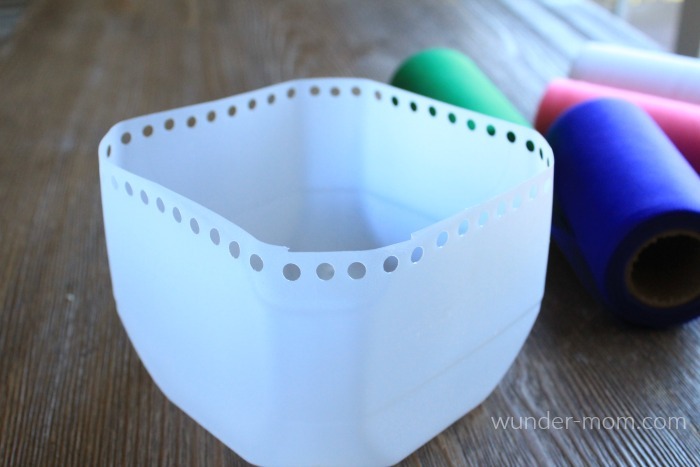 Using your hole punch, punch holes evenly spaced but close together around the top of the milk jug. 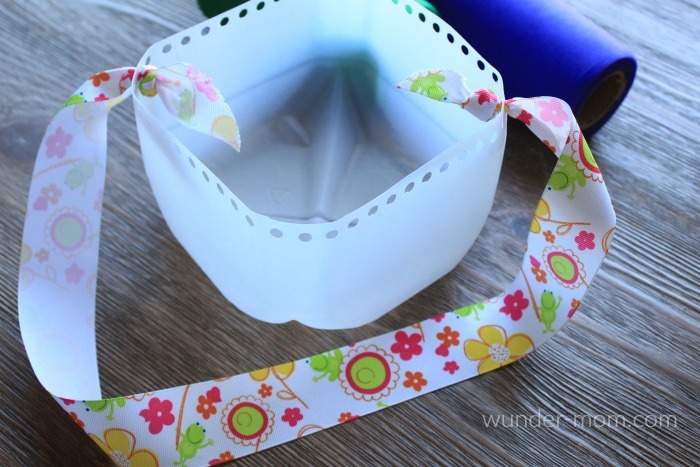 Measure and cut your ribbon to make a handle. 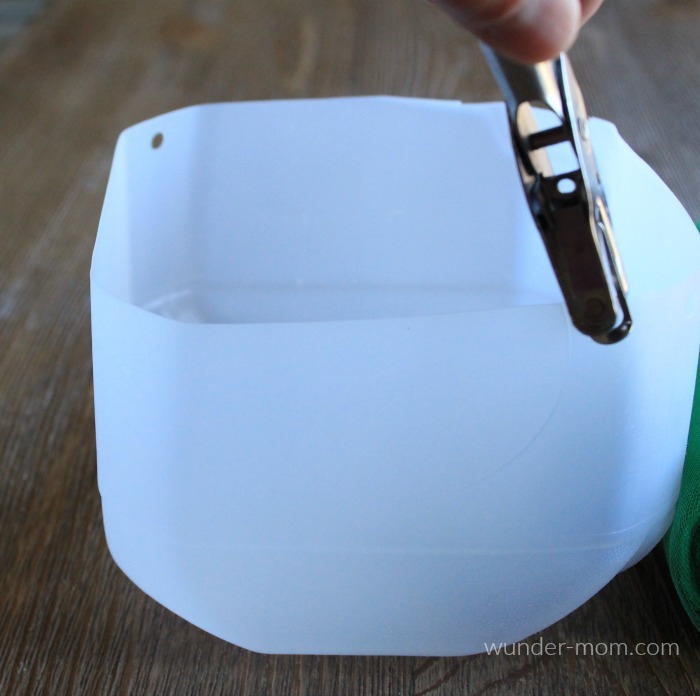 Insert one end of the ribbon to a hole on the side of the milk jug and make a knot. Insert the other end of the ribbon through a hole directly opposite and knot to secure. 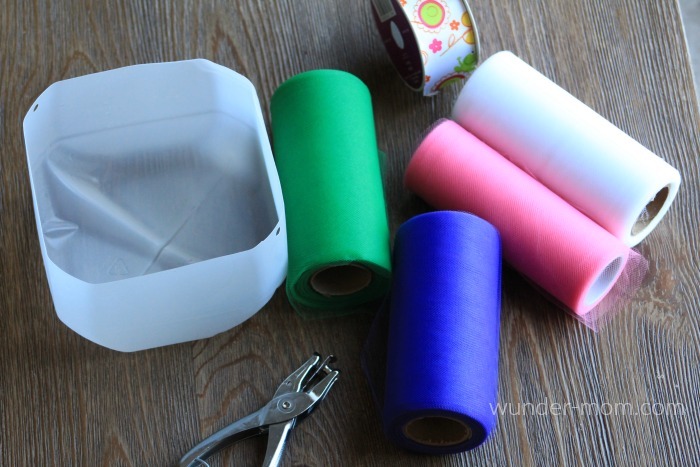 Cut 8″ long strips of tulle, enough to have one piece of tulle per hole. 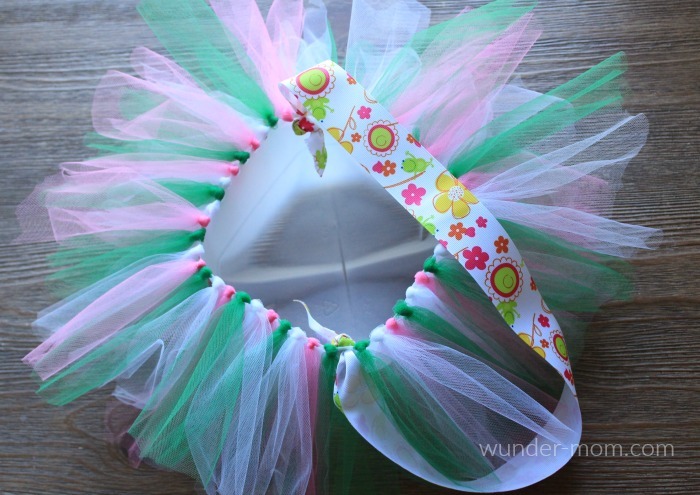 Tie one piece of tulle to each hole in the milk jug, just as you would tie tulle to create a tutu. And that’s it! 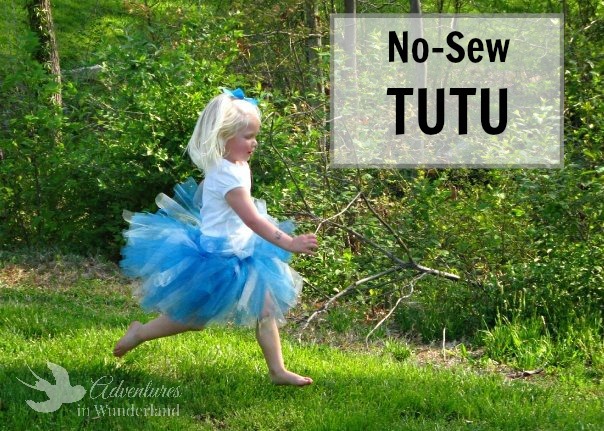 A DIY Tutu Easter Basket is a super easy Easter Craft that’s perfect to take to your egg hunt.